Subsequently, the neem bark has also been reported to possess antidiabetic, hypoglycemic, antioxidant, immunomodulatory, antiviral, larvicide, and growth regulator of Anopheles gambiae, antiplaque, antifertility, and gastroprotective effect. The paste of stem bark of AI is commonly used on wound and scar for rapid healing in Bundelkhand region of India, but it has not been scientifically validated so far. Although, wound healing property of seed oil, leaf oil, and aqueous leave extracts  has been reported but no scientific report is available regarding wound healing activity of neem stem bark to best of our knowledge. 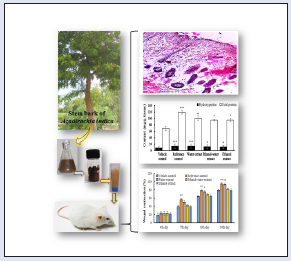 So, the present study was aimed to explore the wound healing potential of stem bark of neem tree in small animals using excision and incision wound models. AI stem bark was collected from medicinal plant garden of CSIR-Central Institute of Medicinal and Aromatic Plants, Lucknow, India and the voucher specimen (No. 13658) was deposited at Department of Botany and Pharmacognosy, CSIR-CIMAP, Lucknow. The stem bark of the plant was shade dried and grounded to fine powder. Accurately weighted 100 g plant material was macerated separately with water, ethanol and ethanol-water (1:1, v/v) for 72 h. All the extracts were filtered, concentrated in vacuo, and lyophilized to obtain 12.5%, 5.3%, and 10.36% of water, ethanol, and ethanol-water extract, respectively. The test samples were incorporated in to an ointment base (vehicle) composed of macrogol 4000 and macrogol 600 (1:4) for topical application. Macrogol 4000 was melted on hot plate and macrogol 600 was previously warmed to the same temperature and then added to the molten macrogol 4000 and stirred until cool. The macrogol ointments were prepared by triturating the 15% (w/w) dried extract each, separately. The ointments so formed were transferred to 5 g collapsible tubes and labeled for further use. Male Swiss Albino mice (23±3 g) were used for this experiment. The animals were kept at controlled laboratory conditions (22±2°C, 55±5% RH, and equal dark-light cycle, acclimatization period: 1 week). The experiments were duly approved by the IAEC, CIMAP, Lucknow (Registration no. 400/01/AB/CPCSEA). The dorsal surface of all animals was made fur-free. After 24 h of hair removal, all the animals were anesthetized under ketamine-xylazine cocktail anesthesia (i.p., 90:10 mg/kg) before wound creation. A circular impression of 177 mm2 diameter was imposed using a round seal on pre-shaved, sterile (wiped with 70% alcohol) dorsal thoracic region. The skin of impressed area was excised with a sterile surgical blade to obtain a full thickness wound. The animals were randomly divided into five groups of five animals each. Group 1 was treated with ointment base only as the vehicle control. Group 2 was treated with povidone–iodine ointment USP (United States Pharmacopoeia) and served as reference standard (positive control). Group 3 was treated with water extract ointment; group 4 with ethanol-water extract ointment and group 5 with ethanol extract ointment in equal amount, respectively. The treatments were given topically (30 mg) once a day for 14 days. The animals were euthanized on the 14th day of wound creation and regenerated tissues from the cured lesion of wound were collected. Calculated quantities of tissue sample were immersed in 2 mL of 6M-HCl and hydrolyzed for 20 h at 105°C in sealed tubes. Tissue samples were filtered through 0.22 μm syringe filter. After filtration 50 μL of sample was taken and 0.4 mL isopropanol was mixed to it. Then, 0.2 mL of solution A [Chloramine T + Acetate-Citrate buffer (l: 4 v/v)] was mixed and incubated at room temperature for 5 min. After incubation, 2.5 mL of solution B [DAB reagent + Propan-2-ol (3: 13 v/v)] was mixed and incubated at 58°C for 25 min. Then this mixture was cooled in tap water and absorbance was taken at 550 nm within 30 min using a ultraviolet (UV)-vis spectrophotometer. The quantity of hydroxyproline was calculated with the help of standard curve. DNA was isolated from the wound tissues of the experimental mice as per kit manual (Axyprep Multisource Miniprep Kit, Axygen Bioscience, USA). The integrity and yield of isolated DNA was checked by electrophoresis (0.8% agarose gel) followed by nano-drop spectrophotometer (ND 1000, Thermo Scientific, USA) at 260 nm. Tissue samples were homogenized in 0.1N NaOH and left overnight. The 2 mL of homogenized tissue was taken in a vial and centrifuged at 5000 rpm for 15 min. In another vial, 1 mL of supernatant was added to 1 mL of reagent (50 mL of 2% Na2CO3 in 0.1N NaOH + 2 mL of 0.5% CuSO4 in 1% sodium potassium tartrate). The samples were incubated for 15 min at room temperature. A total of 100 μL of folin-ciocalteau reagent was added to each sample and left for 30 min at room temperature. Absorbance was taken at 670 nm within 30 min using a UV–vis spectrophotometer. The calculated amount of regenerated tissues was homogenized in double distilled water and centrifuged. The 100 μL of each sample supernatant was mixed with equal quantity of Griess reagent and incubated at 37°C for 30 min. The absorbance was recorded at 543 nm. Sodium nitrite was used as standard. Nitrite levels are expressed in terms of mM/100 mg tissue. A longitudinal paravertebral incision of 3 cm in length was made through the skin and cutaneous muscle on the fur-free dorsal surface of the anesthetized animal. The wounds were closed with interrupted sutures 1 cm apart. The animals were randomly divided into five groups of five animals each and the treatment was similar to that of excision wound experiments. The sutures were removed on 8th post-incision day and the treatment was continued for day 10. The wound breaking strength was measured on day 10 after 6 h of the last treatment with CT3 texture analyzer (Brookfield Engineering Laboratories, USA). In brief, one edge of the rectangle parallel to the wound was immobilized while applying incremental loads to the other edge. The breaking strength was then taken to be the load in grams required to disrupt the wound. (5 mm) of healed lesions were stained with hematoxylin and eosin. The microscopic assessment by light microscope was performed blind on coded slides. All the values are expressed as mean ± standard error of the mean and data was statistically analyzed using Graph Pad Prism ® version 5.01 (Graph Pad software, USA) by one-way analysis of variance followed by Tukey's post hoc test. The values of P ≤ 0.05 were considered statistically significant. In the excision wound repair model, the results of wound contraction after topical administration of the different extracts of A. indica are depicted in [Figure 1]A. Only water extract treated group showed the significant (P < 0.05) wound contraction after 10th day onward compared to vehicle control group. Figure 1: Effect of A. indica bark extract (A) percent wound contraction (B) hydroxyproline and total protein content (C) DNA content and (D) NO content on excised wounds. The data represented as mean±SEM, n=5. One-way ANOVA followed by Tukey's post hoc test was used to assess the statistical difference between the groups. *P<0.05, **P<0.01, ***P<0.001 compared to vehicle control group. [Figure 1]B depicts the hydroxyproline content in the granulation tissues of different extract treated animals on day 14. All the extract-treated groups (13.31±6.65, 11.52±5.76 and 10.87±5.43 mg/g of dry tissue in water, ethanol-water and ethanol extract treated groups, respectively) exhibited significantly (P < 0.05) higher hydroxyproline content compared with vehicle control (7.76±3.88 mg/g of dry tissue). The reference control group showed 13.81±6.90 mg hydroxyproline/g of dry tissue. The DNA content [Figure 1]C was estimated in wound tissues of different groups as 22.72 ± 2.10 (P < 0.001), 20.99 ± 0.68 (P < 0.01), 17.87 ± 0.23 (P < 0.05), 16.4 ± 1.36 μg/100 mg of tissue for reference drug, water extract, ethanol-water extract, and ethanol extract-treated groups, respectively, compared with vehicle control group (11.30 ± 0.53 μg/100 mg of tissue). The levels of total protein in tissue were found to be 119.21 ± 5.81, 100.53 ± 7.88, 94.5 ± 2.34, 95.0 ± 4.72 mg/g tissue in reference drug, water extract, ethanol-water extract, and ethanol extract-treated groups, respectively. All the treatment significantly (P < 0.05) increased the total protein level compared with vehicle treatment (68.59 ± 6.19 mg/g of wet tissue) [Figure 1]B. The nitric oxide levels were indirectly assessed by the quantification of nitrites and found to be 2.01 ± 0.03, 3.05 ± 0.03, 2.12 ± 0.04, 1.71 ± 0.23 mMol/g of tissue in reference drug, water extract, ethanol-water extract, and ethanol extract treated groups, respectively. Nitric oxide level was significantly (P < 0.01) higher in water extract and ethanol-water extract treated groups in comparison to vehicle-treated group (1.41 ± 0.08 m Mol/g of tissue) [Figure 1]D.
From the incision wound repair model, the wound breaking strength was estimated after 10 days of treatment with AI stem bark extracts [Figure 2]. Figure 2: Effect of A. indica bark extract on wound breaking strength in incised wounds. The data represented as mean±SEM, n=5. One-way ANOVA followed by Tukey's post hoc test was used to assess the statistical difference between the groups. *P<0.05, **P<0.01, ***P<0.001 compared to vehicle control group. The breaking strength was increased significantly (P < 0.05) in all treatment groups (258.60 ± 20.96 g, reference drug; 289.40 ± 29.45 g, water extract; 233.80 ± 7.05 g, ethanol-water extract and 224.40 ± 23.98 g, ethanol extract) compared with vehicle treatment (122.20 ± 16.51 g). The excised wound tissues were observed for complete epithelialization, on 14th post-treatment day. The wounded area in water extract of AI-treated group was concealed by new epidermal layers. More fibroblasts cells, collagen fibers, robust dermal blood vessels formation, and deposition of dense and thick mesenchymal matrix were noticed in water extract treated group, which was similar to the effect of positive control group, when compared to vehicle control. In ethanol-water extract of AI treated group, less collagen and thin mesenchymal matrix deposition were observed, while in ethanol extract of AI treated group, poor collagen fibers and epidermis were present [Figure 3]. Figure 3: Wound healing photographs and histological features of wounds in mice treated with bark extracts of A indica. Histology of excision wounds on 14th day after wound creation (H&E staining) at 10X magnification. Arrows pointing events during wound healing; S: scab, E: epidermis, G: granulation tissue, H: Hair follicle, F: fibroblast cells, K: keratin layer, B: newly formed blood vessels. Scale bar: 200 μm. In the present study, different extracts (water, ethanol-water and ethanol) of stem bark of AI were used for evaluation of wound healing potential and various parameters viz. wound contraction, hydroxyproline, DNA content, total protein, nitric oxide content, and wound breaking strength were estimated in both excision and incision wound models. Wound contraction is the process in which the edges of a full thickness wound healed centripetally in order to close the defect. Wound contraction indicates the rate of lessening of unhealed area during the course of treatment so the wound will close faster if the medication is efficient. In this experiment, it was observed that the wound contraction of water extract treated group was faster than other test groups as well as vehicle control group, while the marketed formulation was found to be the most effective among all treatments. Hydroxyproline is present in the collagen fibers of granular tissue so it is considered as an indirect indicator of improved condition of wound healing in animals. Collagen, a principal component of the connective tissue, occupies a central role in the healing of wound by providing milieu for the regenerating tissue as well as structural framework and strength. Collagen is produced by fibroblasts and during wound repair process, assists the wound in gaining tensile strength. The acid hydrolysis of free hydroxyproline releases protein and peptides. The level of hydroxyproline was found to be significantly higher in all test treated groups. This is clearly showing that stem bark extracts of AI facilitate wound healing process. The increase in hydroxyproline and total protein content of extract-treated animals enhanced collagen maturation due to increased cross-linking of collagen fibers. As different healing phases like inflammation, macrophagia, collagenation, contraction, and epithelization are closely interlinked, so stem bark extract of AI could influence the healing process by intervening one or more phases. The level of total protein was found to be significantly higher in animals treated with water extract formulation while other groups also showed increased level of protein but not up to significant level when statistically analyzed. The activity of fibroblast might be a possible cause of increased wound contraction in test treated mice. The significant increase in the protein and hydroxyproline content revealed the increased migration of fibroblast cells, epithelial cells, and synthesis of extracellular matrix together with collagen during the healing process in treated mice. The increased DNA content of treated wounds indicate hyperplasia (cellular proliferation) of cells. The DNA content of extract treated animals was also noticed significantly higher as compared to vehicle control group. Water extract of stem bark of AI is showing significant wound healing property in excision as well as incision wound model hence supporting its traditional use. Therefore, cream/paste formulation of water extract of AI stem bark can be used as ideal dressing agent for the treatment of wounds. However, further investigations are required to reveal its exact mechanism(s) of action and efficacy on different type of wounds. The authors are thankful to The Director, CSIR-Central Institute of Medicinal and Aromatic Plants (CIMAP), Lucknow for providing infrastructure facilities to carry out this research work. CIMAP communication no. CIMAP/PUB/2016/22. The financial support from in-house project under OLP-08 is duly acknowledged. Biswas K, Chattopadhyay I, Banerjee RK, Bandyopadhyay U. Biological activities and medicinal properties of neem (Azadirachta indica ). Curr Sci 2002;82:1336-45. Biswas B, Kaplay RD. Azadirachta Indica (Neem): It's economic utility and chances for commercial planned plantation in Nanded District. Int J Pharma 2011;1:100-4. Paul R, Prasad M, Sah NK. Anticancer biology of Azadirachta indica L (neem): a mini review. Cancer Bio Ther 2011;12:467-6. Siddiqui S, Siddiqui BS, Faizi S. Studies in the chemical constituents of Azadirachta indica Part II: Isolation and structure of the new triterpenoid azadirachtol. Planta Med 1985;51:478-0. Siddiqui S, Faizi S, Siddiqui BS. Ghiasuddin. Constituents of Azadirachta indica : isolation and structure elucidation of a new antibacterial tetranortriterpenoid, mahmoodin, and a new protolimonoid, naheedin. J Nat Prod 1992;55:303-30. Subapriya R, Nagini S. Medicinal properties of neem leaves: a review. Curr Med Chem Anticancer Agents 2005;5:149-6. Siddiqui BS, Ali ST, Rajput MT, Gulzar T, Rasheed M, Mehmood R. GC-based analysis of insecticidal constituents of the flowers of Azadirachta indica A. Juss. Nat Prod Res 2009;23:271-3. Mukherjee A, Sengupta S. Characterization of nimbidiol as a potent intestinal disaccharidase and glucoamylase inhibitor present in Azadirachta indica (neem) useful for the treatment of diabetes. J Enzyme Inhib Med Chem 2013;28:900-10. Purohit A, Dixit VP. Hypoglycemic effect or neem bark and flower on streptozotocin induced diabetes in mice. Anc Sci Life 1991;11:28-0. Prakash D, Suri S, Upadhyay G, Singh BN. Total phenol, antioxidant and free radical scavenging activities of some medicinal plants. Int J Food Sci Nutr 2007;58:18-8.
der Nat JM van, Klerx JPAM, van Dijk H, De Silva KTD, Labadie RP. Immunomodulatory activity of an aqueous extract of Azadirachta indica stem bark. J ethnopharmacol 1987;19:125-1. Tiwari V, Darmani NA, Yue BY, Shukla D. In vitro antiviral activity of neem (Azardirachta indica L.) bark extract against herpes simplex virus type-1 infection. Phytother Res 2010;24:1132-40. Howard AF, Adongo EA, Hassanali A, Omlin FX, Wanjoya A, Zhou G. Laboratory evaluation of the aqueous extract of Azadirachta indica (neem) wood chippings on Anopheles gambiae s.s. (Diptera: Culicidae) mosquitoes. J Med Entomol 2009;46:107-4. Wolinsky LE, Mania S, Nachnani S, Ling S. The inhibiting effect of aqueous Azadirachta indica (Neem) extract upon bacterial properties influencing in vitro plaque formation. J Dent Res 1996;75:816-2. Purohit A. Antifertility efficacy of neem bark (Azadirachta indica A.juss.) in male rats. Anc Sci Life 1999;19:21-4. Maity P, Biswas K, Chattopadhyay I, Banerjee RK, Bandyopadhyay U. The use of neem for controlling gastric hyperacidity and ulcer. Phytother Res 2009;23:747-5. Bwala D, Elisha I, Habu K, Dogonyaro B, Kaikabo A. Management of surgical wounds using crude neem oil in one year old ram: A successful report. J Vet Med and Anim Health 2011;3:75-8. Pandey IP, Ahmed SF, Chhimwal S, Pandey S. Chemical composition and wound healing activity of volatile oil of leaves of Azadirachta indica A. juss. Adv Pure Appl Chem 2012;1:62-6. Osunwoke EA, Olotu EJ, Allison TA, Onyekwere JC. 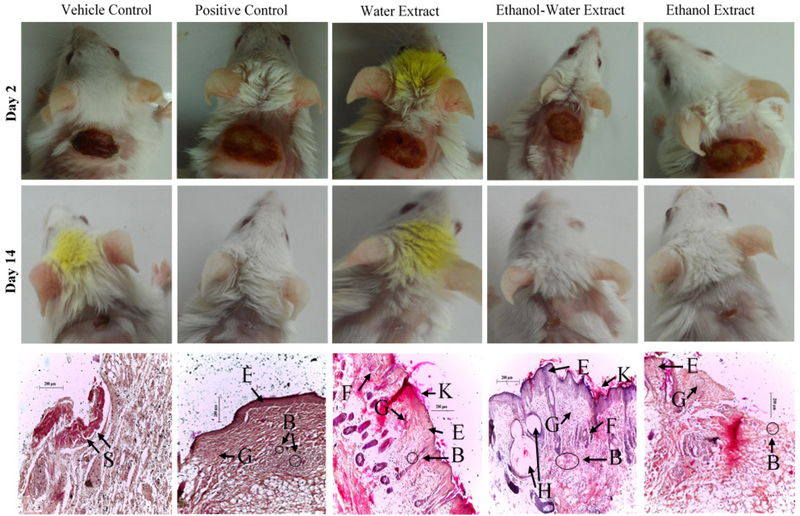 The wound healing effects of aqueous leave extracts of Azadirachta indica on wistar rats. J Nat Sci Res 2013;3:181-6. Yadav KS, Yadav NP, Rawat B, Rai VK, Shanker K, Rao CV. An Assessment of wound healing potential of Argyreia speciosa leaves. Sci World J 2014;2014:406921, doi: 10.1155/2014/406921. Woessner JF Jr, The determination of hydroxyproline in tissue and protein samples containing small proportions of this imino acid. Arch Biochem Biophys 1961;93:440-7. Lowry OH, Rosebrough NJ, Farr AL, Randall RJ. Protein measurement with the Folin phenol reagent. J Biol Chem 1951;193:265-5. Hevel JM, Marletta MA. Nitric-oxide synthase assays. Methods Enzymol 1994;233:250-8. Peacock EE. Contraction. In: Peacock EE, editor. Wound repair. 1984; 3rd Philadelphia, USAWB Saunders Company 39-45. Thakur R, Jain N, Pathak R, Sandhu SS. Practices in wound healing studies of plants. Evid Based Complement Alternat Med. 2011;2011:438056. doi: 10.1155/2011/438056. Cohen IK, Diegelmann RF, Lindblad WJ. Wound healing: biochemical and clinical aspects. Philadelphia, USA: WB Saunders Company 1992;130-131. Mukherjee H, Ojha D, Bharitkar YP, Ghosh S, Mondal S, Kaity S. Evaluation of the wound healing activity of Shorea robusta , an Indian ethnomedicine, and its isolated constituent(s) in topical formulation. J ethnopharmacol 2013;149:335-3. Wang JP, Ruan JL, Cai YL, Luo Q, Xu HX, Wu YX. In vitro and in vivo evaluation of the wound healing properties of Siegesbeckia pubescens . J ethnopharmacol 2011;134:1033-8.